There’s no better film to bring this retrospective of classic British horror to a close than The Monster Club. Even in 1981, it must have felt like an anachronism. A Milton Subotsky-produced portmanteau starring the great Vincent Price and based on a collection of stories by R. Chetwynd-Hayes, everything about it feels dated and no amount of clumsy new-wave pop being shoehorned in was ever going to change that. 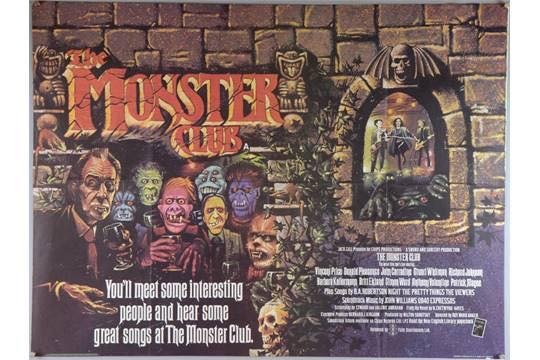 Saying that, The Monster Club is not without its charms and succeeds as often as it fails. When the famous horror author R. Chetwynd-Hayes (John Carradine) aids a starving Vampire by the name of Erasmus (Vincent Price) with a donation of his blood, he is rewarded by being taken to The Monster Club, an after-hours spot where he is given a lesson in the complicated family tree of vampires, werewolves and ghouls. Oh and werevamps, weregoos, vamgoos, shaddies, maddies, raddies and mocks. There’s no small amount of pathos in this segment. Poor Raven really is a sad soul and Laurenson delivers an affecting turn, while there’s a definite, complicated chemistry between him and Kellerman. 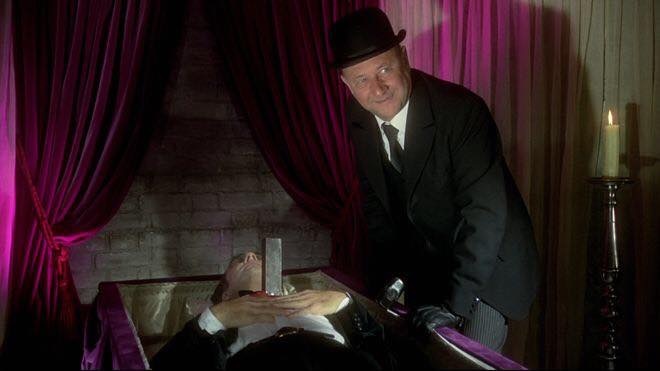 The Shadmock’s deadly whistle is probably an idea that works better on prose, but its effects are horribly realised on screen and make for a quite a shocking ending, even though you know what’s coming. There’s an attempt at post-modernism with the introduction of Vampire producer Lintom Busotsky (very droll) introducing a film “based on his own childhood”, where a young boy is bullied at school, unaware that his beloved father (Richard Johnson), who he rarely spends time with, is a Vampire. His father is being hunted by a bungling team of council worker-style Vampire slayers led by Donald Pleasance, resulting in a final confrontation on the basement of their suburban home. God, this is dreadful. From Johnson’s Sesame Street Dracula accent, Britt Ekland’s complete miscasting as a Rheah from Butterflies type housewife, Pleasance’s “comedy” antics or the fact it ends with a gag about never leaving home without a “stake-proof vest filled with tomato ketchup”, it’s truly, truly appalling. Much better is The Ghouls, a delightfully atmospheric tale of the Humgoo. American director Sam (Stuart Whitman) is scouting locations for his next film when he finds himself in isolated, run-down village of Loughville. This is a wonderfully atmospheric little chiller. 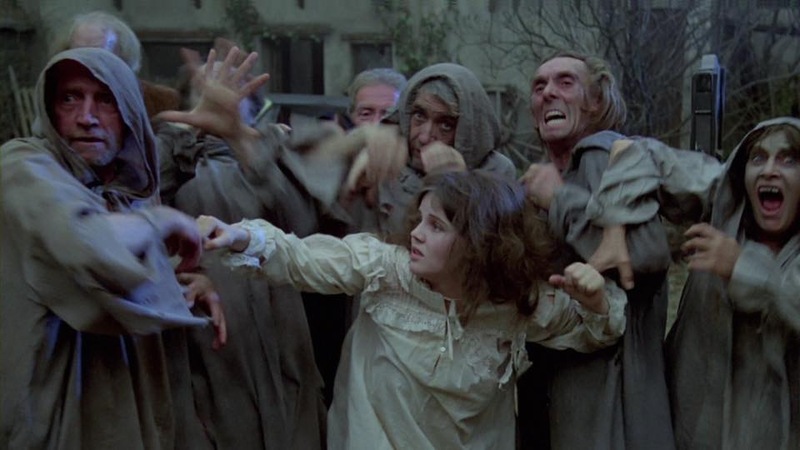 The set design of the decrepit village surrounded by fog is marvellously realised and a decent size, giving the impression of a living, breathing place, albeit one inhabited by flesh-eating ghouls. Sam’s plight calls to mind HP Lovecraft’s Shadow Over Innsmouth, while the flashback scene is cleverly brought to life with some stunning John Bolton artwork. It’s without a doubt The Monster Club’s finest moment and one of my favourite portmanteau chapters ever. 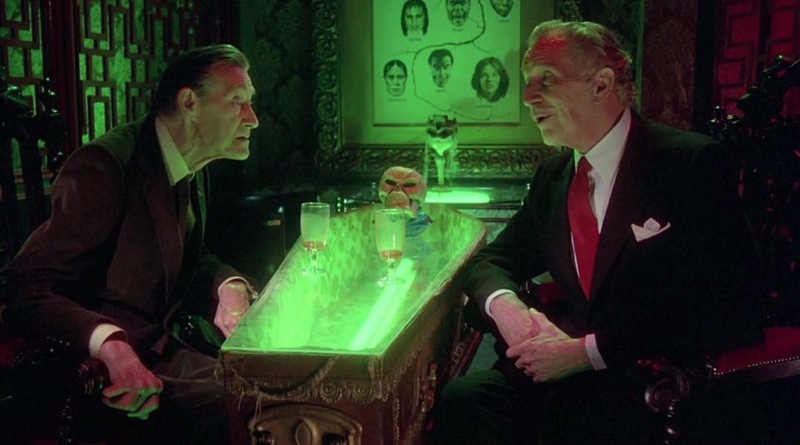 As for the framing sequence itself, Vincent Price is at his most charming here, all serpentine mannerisms and arch politeness, while Carradine is as gentlemanly as they come, meaning the pair are a real joy to watch together. Annoyingly, they’re in a “club” populated with customers dancing wearing what can only be described as high street Halloween masks. Honestly, pretty much every one is shockingly poor, though not as poor as the music soundtracking the night. The Pretty Things, The Viewers and most horrific of all, B.A. Robertson murder every chance they’re given to entertain with a succession of stinkers. All of that kind of sums up The Monster Club. Great in parts, awful in others, dated for the most part, while desperately trying to feel current and contemporary but getting it so, so wrong. It’s patchy, but undeniably enjoyable for the most part, but more than anything it feels like the end of an era. Horror had moved on from this kind of thing long before this and a mere four months later An American Werewolf In London would be released, setting a bar for years to come. It had a good innings, but sadly, the classic era of British horror was, by this point, most definitely dead and buried.